Official site of Joint-Stock Company MSZ-SALUT - the Moscow machine-tool plant. Control flexibility provides not only selection of optimum grinding modes (sequence of allowance removal, large number of different table and cutting tool feeds, frequencies, depth and regimes of dressing, etc. in one cycle), but also possibility to grind broaches with specific features (for example, broaches with both end dead zones located along the axis, grinding without table travel, or broaches having non-treated cavities). Capabilities of flexible profiling of grinding wheel provided by CNC dressing device allow to grind simultaneously lateral sides, internal diameter, rounding and chamfering of bottom and tip of spline tooth. 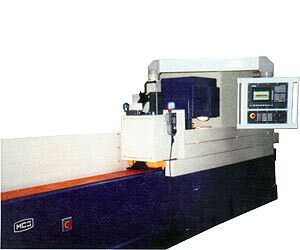 Setting-up of machine-tool units and systems providing cycle and profile of grinding wheel is fulfilled from the control panel. Input of part and regime data to CNC system (directly from drawings or operation sheet) as well as resetting according to grinding results are fulfilled in dialog mode excluding the need the programming knowledge. Independent correction of each profile element (left and right lateral sides of internal diameter) is foreseen. High service quality is provided by visual (on panel display) diagnosis of input parameters and functioning of separate machine systems. Simulation of machining cycle and profile of grinding wheel can be realized on display.